Dog vaccinations are a very controversial topic among dog owners and dog health experts. 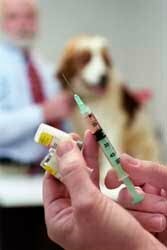 Every dog owner must choose whether or not to vaccinate their dog, which vaccines to administer and how often. It’s important to know all the facts. Vaccines for parvovirus, distemper, adenovirus and rabies are generally considered corevaccines. Most states require that all dogs be vaccinated for rabies annually. Non-core vaccines include parainfluenza and Bordatella bronchiseptica — both meant to prevent kennel cough — Borrelia burgdorferi for lyme disease, leptospirosis, coronavisrus, hepatitis, Giardia, measles, rattlesnake, and many more. The traditional practice is to vaccinate puppies at six weeks, nine weeks, 12 weeks, and fifteen weeks of age, then go to an annual shot. Nursing puppies receive immunities from their mother’s milk. Any immunities still present from nursing will render the vaccines ineffective, so the vaccines are administered frequently until it can be assumed that no antibodies are left over from nursing to prevent any gaps in protection. At the very least, vaccinations put stress on the dog’s immune system for several days. It is common for dogs to be sluggish and generally not feel well while their system is recognizing and responding to the diseases that have been introduced. Additional stress to the dog’s body, such as surgery, should always be avoided during this time period. Dog vaccinations should never be given to a dog who is ill or injured as this will only make it harder for the body to heal. Some dogs have severe allergic reactions with symptoms including vomiting, diarrhea, whole body itching, collapse, difficulty breathing or swelling of the face or legs. If such symptoms occur, the dog should receive immediate medical attention. Even a single vaccination carries risks, but most vaccine-related health problems are caused by over vaccinating. Higher vulnerability to diseases such as parvovirus have been passed down in dog breeds that have regularly been over-vaccinated through many generations. While some veterinarians have concluded that vaccinations are ineffective, unhealthy and unnecessary, most still believe in vaccinating but on a much more limited basis than has previously been the standard. * Does the dog live in an area where disease is common and easily spread due to climate and population? * Does the dog’s parents and grandparents have a history of vaccine-related illness, such as hip dysplasia and cancer? If vaccines are given at all, they should always be kept to a bare minimum. Dogs should only be vaccinated for diseases that they are truly likely to be exposed to, and vaccines should be administered as infrequently as possible. In the past, the standard was to vaccinate annually. Although frequency varies with each type of vaccine, recent research has shown that most dog vaccinations are effective from three to seven years, and some last for the dog’s entire lifetime. Titer testing can be used to determine whether a dog still has the needed antibodies and can help prevent over vaccination. Dog vaccinations are often administered several at a time, in 3-way, 5-way or 7-way bundled shots. Adverse reactions and impact to the immune system can be minimized by administering vaccines separately and waiting three months in between each vaccination. 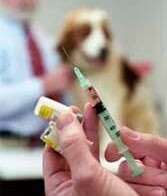 Deciding whether or not to vaccinate can be one of the most confusing and frightening choices a dog owner has to make. While on one hand, dogs can die, have shorter lives or suffer long-term debilitating illness; if vaccinated, exposure to life threatening and deadly diseases such as parvo, rabies and distemper is a very real concern. Dog owners should thoroughly research the vaccines they are considering for their dogs and evaluate each situation individually.